Several researchers concentrated their studies on the development of super oleophobic and super hydrophobic materials with potential applications such as self cleaning, corrosion resistance, anti-fogging, biomedical devices and many other fields. Two main approaches isolated or in synergy can give rise to optimized behavior: i) surface structuring/texturing and/or ii) modification of the chemical surface by coatings deposition. Super hydrophilic materials have been the main focus in most of the studies but achievement of super oleophobic materials, with hydrophobic or hydrophilic properties, is the great challenge of the project. 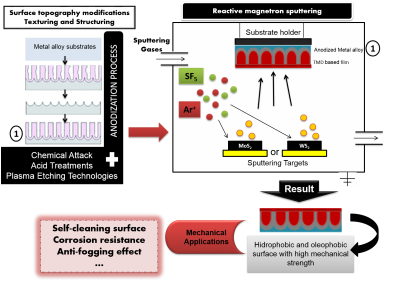 Surface structuring by anodization and etching plasma technologies, respectively, before and after TMD (transition metal dichalcogenides) based coatings deposition, will be performed in order to create in a first step omniphobic surfaces and, in a second step, oleophobic/hydrophilic surfaces. Applied Surface Science 422:430-442, 2017. Simone P Rodrigues, José M. Paiva, Silvia De Francesco, Margarida I. Amaral, Filipe J. Oliveira, Rui F. Silva. Editors: R. Sonntag and J. P. Kretzer, Publ. Imperial College Press, Chapter 14, pp. 413-430, 2016.